Before you ask…yes, this post has some relation to the Alameda Post Antiques Faire. It being officially Fall (as of September 23rd) I was beginning to think of Fall Fashion. So when I was at the last Antiques Faire, this one stand caught my eye. 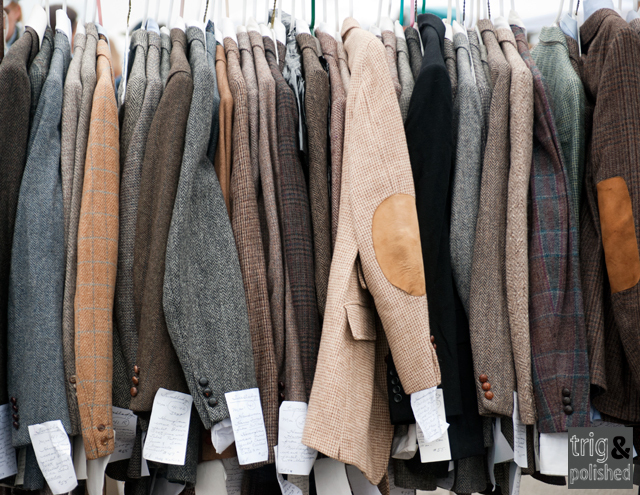 First I spotted the elbow-patched jackets and as that sight reeled me in(it’s no secret that I have a thing for elbow patches on men), I saw the tables piled high with hundreds of tweed coats. This was how I discovered the Tweed Lady. That’s all she sells, vintage Harris Tweed Coats. Each coat has a handwritten tag which states it’s pedigree with such details as type of weave, label, and price. This lady knows her tweed! She even had a little visual aid describing Harris Tweed and it’s origin. Yes, I wikapedia-d Harris Tweed. Pretty interesting stuff. As I was checking out the Tweed Lady’s lot, I wasn’t surprised to hear the excitement in the voices of the stylish lads that spotted all that tweed. Her prices seemed very reasonable for vintage and from what I saw, it was all in excellent condition. Her prices seemed to range from $25- $100. Not too shabby. Looking smart is almost as good as being smart. A jacket with elbow patches boosts your style I.Q. by twenty points. If you can’t make it to the Alameda Faire, you can find tweed coats new or used by searching the various men shops or thrift stores. As long as you wear your tweed well, you are set. But be careful, tweed can look horrible if worn wrong. You don’t want to look like Alex P Keaton or like a stuffy old professor who’s been wearing the same coat pre-tenure up until retirement. Stay tuned for my next post which will show you how to wear them. Consider me your helpful sister or platonic friend who is trying to help you look good to the ladies (or gents, if that’s your thing). And I mean it about elbow patches. Trust me, your stock will go up 100%. I’m just giving you my female opinion. If you need more persuasion,check out what Gilt has to say about it. One other thing, the next Alameda Point Antiques Faire is happening on October 2nd. Please be there so I can take your picture and glorify your style on my blog. I love this post. 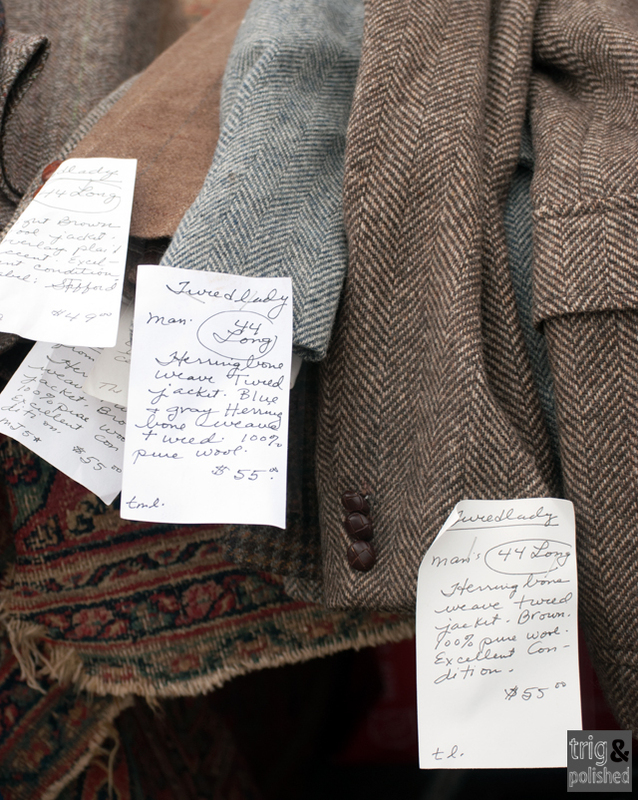 This Tweed Lady is onto something – very cool, love the handwritten notes – and your photos of’ em. Thanks for sharing!